Quest of the Traitor Saint review by Ruber Eaglenest. So, I’m quite late with some of this, but here it is. I don’t think this is a full review because I couldn’t finish the game, but here we go! Really nice world building. Even with an enciclopedia inside! Mobile friendly: Not at all. Playable, but it is not ideal. It has not autosave, nor proper way to save the game. It has a bookmark system, common in some Twine 1 games, that I found it unusable, at least in mobile. I don’t understand it, and I don’t know how to use it. So I could not finish the game, although I tried several times. General: I will approach this based on the common criticism that the game has received. That is: the art style and the little ponies. At first I didn’t like the art style. I feel it is too much sketchy to pass for proper game art, but then the PC reveals that he is constantly sketching while travelling in his notebook… so this just made clic. It work, because it works in context. Sadly I feel that the first sketches doesn’t do justice for what the author could accomplish… because later the sketches about the encyclopedia of fauna and flora of the planet are really great (great inside the context of what I said: the PC sketching in a notebook). So, I ended loving the art style soooo much, just because of that. 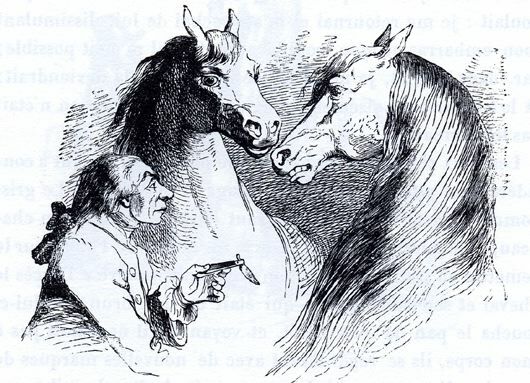 The second common criticism is the graphical representations of the horses. You know, the are like fan art of My Little Pony. And I think that criticism has a point. When you read about the culture of the horses you think more in… yeah, talking powerful horses, so the revelation of the art could be striking. But this is just plain prejudice. People has a lot of prejudice against children stuff, more if it is soooo popular as My Little Pony. But I am father of two daughters, and so, I know better, and it is my obligation to let the world know that My Little Pony is good stuff. In the first place, it is great artistic design. You just could cast an eye to any galery of art of wannabees artists here and there to see that the ponies are just one of the main inspirations for them. THERE ARE JUST A HELL TONS of fan art of them. And second, My Little Pony is great storytelling. I know this because I surprise myself getting catch by the narrative of the chapters when my little daughter is watching the show. But this is common. Some children show has bad literature in it, but a LOT of children show has really great literature on them because they are run by really great professionals. Maybe you don’t like those because you are not their targeted audience, but as I said, fathers know, and fathers knows better. So… My Little Pony as main inspiration for the world-building and aesthetic design of the game: WHY THE HELL NOT? Said that, Let’s continue what’s really great of the game: the world-building. It is just amazing. As some reviewers said, the intro and blurb are heavily dosed on lore and world-building, but it just worked really great for me. This is supported on the encyclopedia, a literally encyclopedia comprising lore and world-building. So… this is neat feat. This is the author showing off that he has built a proper world-building for a new extraterrestrial race, and its corresponden lore. Look here! it is all in the encyclopedia! Well done, Sir. Best of it, the encyclopedia is integrated in the gameplay, with proper links that points to the proper animal or plant that the PC is seen in each location. This leads me to some criticism of what I think the game does not do very well, or more, it lacks. Ok, the worldbuilding is there, the lore, the fauna, the flora, and such… but: you can’t interact with it. You can traverse the scenery, but it is just that: scenery: I miss to interact with the animals, with the highlights of the landscape. To smell the flora, to collect some herbs. Etc. I think this game would have benefited a lot with a parser implementation, because the lacking would be evident while programming the game. But as a player, a lot of my motivations to interact with the world were not supplied or allowed by the game and implementation. There are more great stuff in this game: for example the characterisation of the PC’s companion, or her dialog and conversation system, but I’ve talked more of those things that stands out more, good or bad. And I could not finish the game, so I could not comment on that. Score: Great world-building that is not enough interactive and too static. But I love all the love (sic) poured into it, even the ponies and the sketches. Good game that I recommend. I like the fact that, for the most part, people have taken the whole “obviously based on My Little Pony”-thing in stride, altough it sounds like people would’ve preferred a more realistic style. (I’m working on a look for the Horses that’s more of a compromise, not photorealistic, but closer to maybe an anime or an indie comic). And… well, there’s two reasons I didn’t do that. The first i one of practicality and laziness: if I have to draw several dozen pencil studies of slightly mutated Horses, I’m going to loose it. But the honest truth is that I was inspired by My Little Pony, and it’s generally not a good idea for a story to be ashamed of what it is; that often prevents it from reaching its full potential. I’d be lying if I said I didn’t feel a bit silly with all the Serious Authors doing Serious Things around, and here I am, prancing with the ponies. But… well, let’s put it this way, there was a point in time where the average science fiction fan was 13 and sci-fi was dismissed as frivolous pulp literature. Heck, at the time Zork was written, the fantasy and hacking references that make it up would’ve been seen as similarly disreputable trending nerd-stuff. It’s been a long road, but only the most out-of-touch these days would say science fiction doesn’t have merit as literature. Comics have followed the same path, awkwardly stumbling into mainstream acceptance and anime is not that far behind. If science fiction can be meaningful in spite of its origins as pulp, so can cartoons. At least, that’s how I feel. I am confident that in 5-10 years, it’s not gonna seem that weird, just a genre like anything else. I think, definitively, you have something there. But it is true that grows up have problems to accept some fiction tropes that are meant to child or very young audience. So I think it must be a conscious risk for you to present that to the IF Comp. But I repeat myself. I feel you have something there, in the same way Birdland hit a spot for certain audience, I think you could definitively has something in your hands important for a particular audience, but maybe you should study more how to appeal to those and how to write to those. I’ll explain myself, maybe the heaviness in lore is too much for a young audience. But later, the interaction with the pony co-protagonist is nailed, in my opinion. She is clever, cool and very curious pony. So that is… maybe it is a question of define and study what kind of work must be the Saints of Horses series. I definitively will look for an update version (with autosave please! or slots), and I hope you continue to work in the second part. Returning to the topic of My little pony, definitively is a polarizing series. There are a ton of young teens that love the series, but at the same time there are a lot of teen that despise it. So… I think it is very difficult stuff.